I’d eat this for breakfast, lunch or dinner! 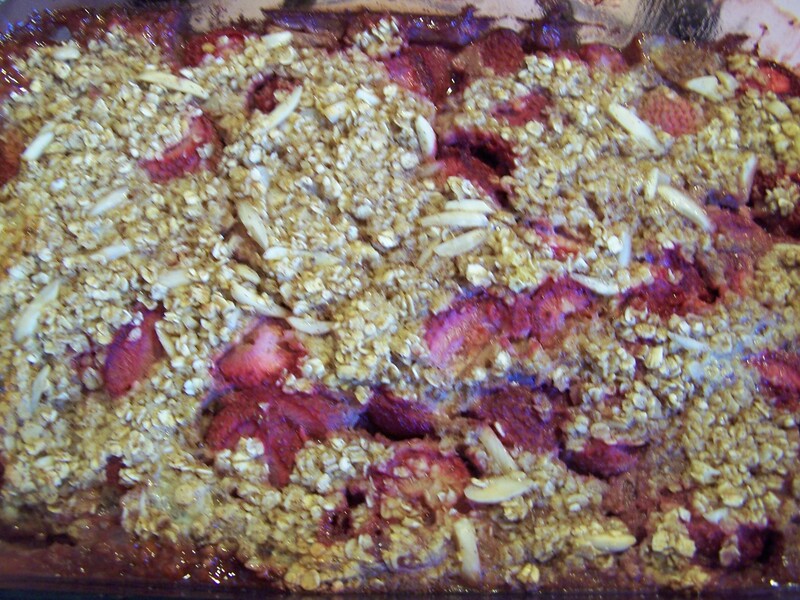 ORIGINALLY POSTED MAY 10, 2013: The other day I came across a great new recipe for baked oatmeal. It was on Skinnytaste.com, a blog I follow on Facebook. I love all kinds of oatmeal from steel cut to overnight to baked. This recipe also had a fruity combination that I love: strawberry and rhubarb. I didn’t have rhubarb, but I noticed that it had bananas in it, and strawberry and banana is another top favorite combination of mine so I decided to make it without the rhubarb. Besides the fact that I skipped the rhubarb, the other thing about this recipe is that I made it as an after school snack, not for breakfast! It was so good, and everyone had seconds, everyone loved it and there was very little left over. I would definitely make this recipe again and if I had rhubarb, I’d throw it in there, but it was also fine without! 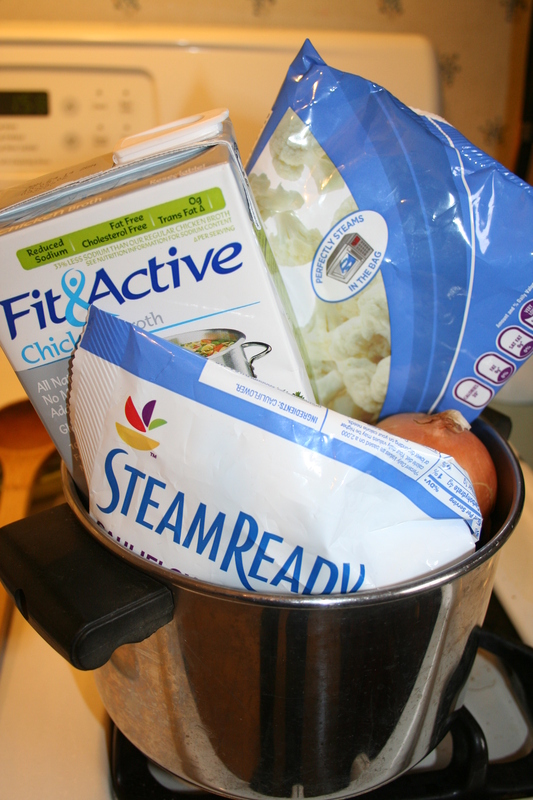 This snack was quick to put together with simple ingredients. Preheat the oven to 375° F. Lightly spray a 9 x 9″ ceramic baking dish with cooking spray; place banana slices on the bottom of the baking dish and set aside. Combine the strawberries and rhubarb in a large bowl. Add honey, sprinkle with cornstarch and toss until fruit is well coated and place in prepared baking dish over the bananas. In a medium bowl, combine the oats, half of almonds, baking powder, cinnamon, and salt; stir together. 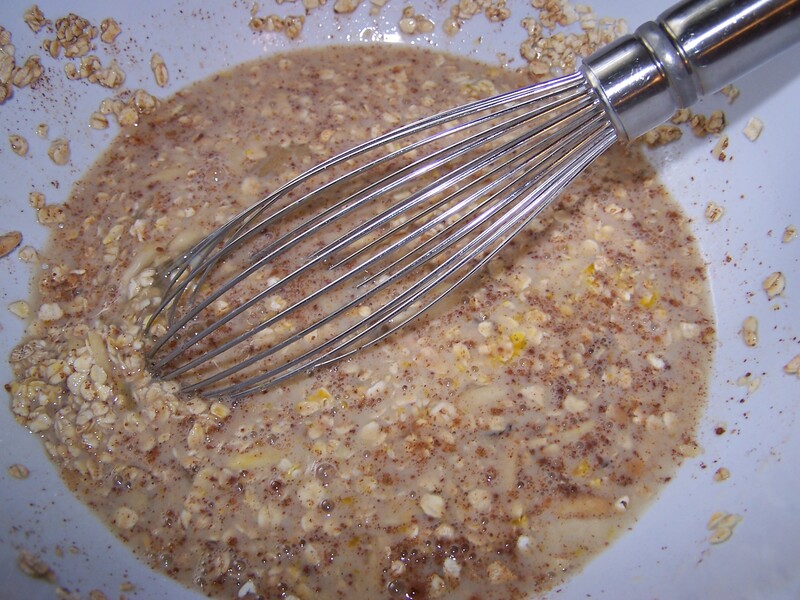 In a separate bowl, whisk together the remaining honey, milk, egg, and vanilla extract, then add to the oats. Pour the oat mixture over the strawberries and rhubarb, making sure to distribute the mixture evenly. Sprinkle the remaining almonds over the the top. Bake the oatmeal for about 40 minutes, or until the top is golden brown and the oatmeal has set. Serve warm from the oven. You can either use fresh or frozen cauliflower for this recipe. Recently, my friend Karen sent me the link to a soup she really loved. It’s so fast and has very easy ingredients, and it’s one that I can drink in a mug, so it’s good for the days where I can’t stop for lunch. The link was to the blog Skinnytaste, and this soup has been a huge hit at our house. The recipe originally calls for a head of cauliflower, and I have to say, it’s absolutely the best when made with fresh cauliflower. It’s thicker and tastier. But, I like keeping bags of frozen veggies on hand in my freezer for when I’m out of fresh veggies and I like that this recipe can also be made using the frozen ones. Since trying this recipe out over February vacation, I’ve made it at least four or five times. You literally throw everything into the pot and let it simmer. When it’s done you blend and eat. It’s that simple. It’s completely healthy and it makes a great meal or even a great in-between-meals snack. Sometimes Caroline will have this as her after school snack. I’ll take that any day for a healthy choice! The big, big deal though is the fact that prior to receiving this recipe, I did not have an immersion blender, otherwise known as a hand blender. I tried making it without one, and I could not. It was kind of a mess, to say the least. A new immersion blender=a whole new world for me and my kitchen! 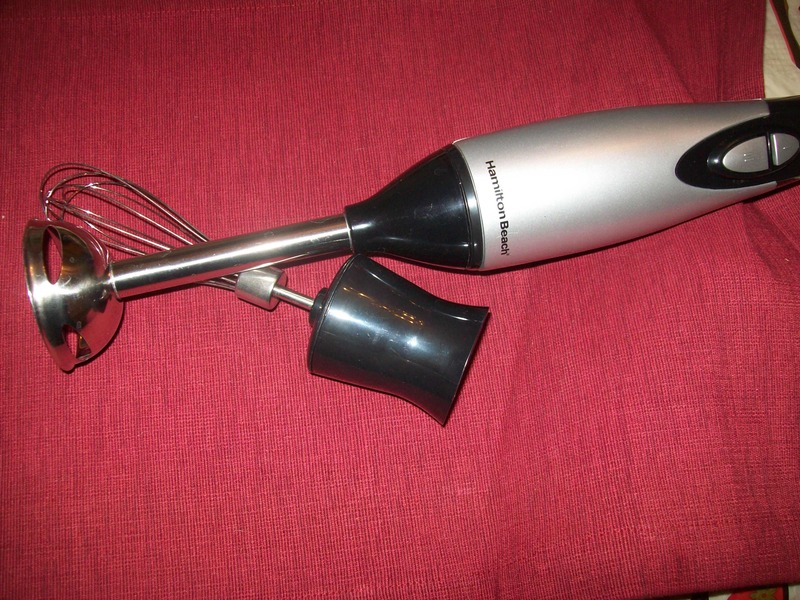 I now have this immersion blender, and I SOOOO love it. I wanted one but I did not want to spend a lot of money so my friend Debra recommended this one from Walmart and it’s been great. I’ve used it for this soup and my cream of broccoli soup. I’ve also used the other attachment piece for making instant pudding and the batter for french toast. The immersion blender is essential for this recipe, and I highly recommend both the recipe and the blender to make it happen! Below is Gina’s recipe from Skinnytaste, and I hope you’ll visit her blog and check it out! Using a large head of fresh cauliflower made this batch of soup so thick and smooth and creamy. **we use chicken broth instead of water and bouillon cubes. In a 5 quart saucepan, add all ingredients. Cover and simmer until vegetables are tender (about 20 minutes.) 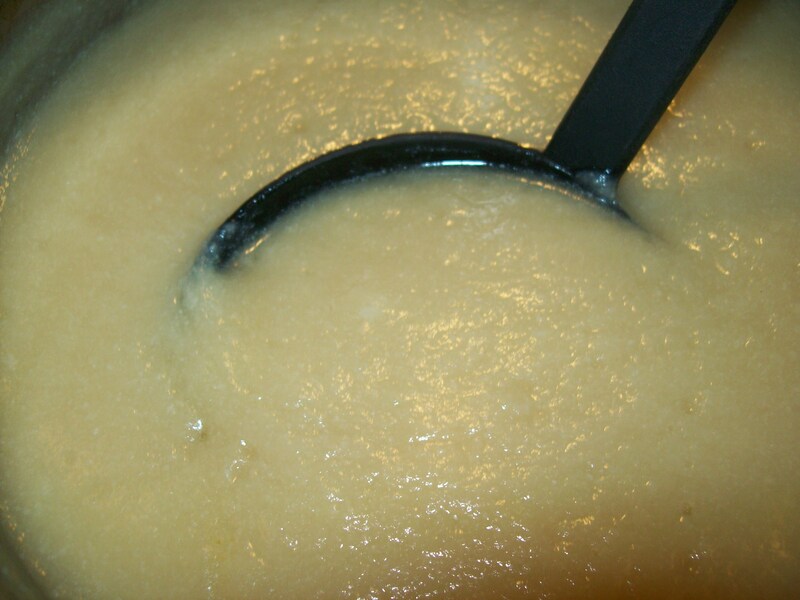 Puree with an immersion blender until smooth.